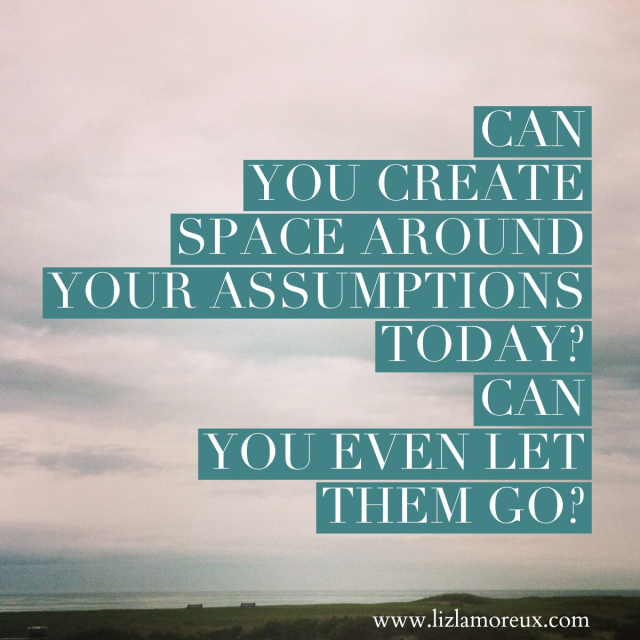 Can you create space around your assumptions today? Can you let go of assuming someone's life is perfect based on the picture you are painting with cobbled together Facebook statuses, Instagram photos, and stories you've heard someone else tell? Can you spend time observing your own way of moving through the world before you fill in the blanks about how you think someone else does? Can you put aside your comparisons and just be right here living your life? Can you imagine what it might be like to be the person next to you right now? Can you find empathy buried underneath the fear that you aren't enough? Can you take a breath before you speak, write that status, send that email? Can you take three breaths? Can you walk outside and listen to the birds singing instead of comparing yourself to the chatter online today? Can you create space around your heart and choose love? Can you choose to love yourself right now, right here, in this moment? Can you choose to trust you are enough and let go of those assumptions you are clutching? These are just a few thoughts I've been having over here as I continue to navigate all that this crazy, awesome, hard, beautiful life holds. PS To receive little reminders and love notes like this one in your inbox, sign up to receive my (almost) weekly newsletter here.